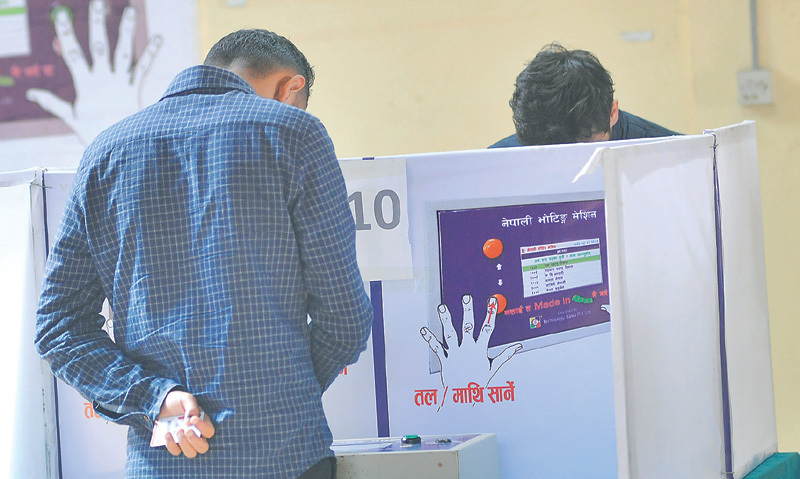 Amid clashes and violence, the Free Students Union elections were held in around 170 constituent and affiliated colleges of the Tribhuvan University on Wednesday, with thousands of students exercising their franchise for the first time in eight years. The polls which were largely affected due to the ‘unethical activities’ of the students will be litmus tests for the sister wings of various political parties. According to the TU, the elections were held in just 22 of its 60 constituent colleges, with 150 of the 1,084 affiliated colleges conducting the polls. The elections could not be held at several constituent colleges, including the TU Central Campus, Ratna Rajya, Tri-Chandra, Nepal Commerce, Shanker Dev, Amrit Science, Prithvi Narayan Pokhara, Mahendra Multiple Nepalgunj, which are considered politically vibrant. Among the TU constituent colleges, the polls were held at Sano Thimi Campus, Pulchowk Engineering, Thapathali Engineering, Tribhuvan University Teaching Hospital and its nursing campus and Bhaktapur Multiple Colleges, among others. TU Rector Sudha Tripathi, also the coordinator of the election committee, said the colleges which could not conduct the elections will have to wait for two years to hold the election. “We have suspended our academic activities to facilitate the elections. We can’t wait anymore,” she said at a programme in the Capital on Wednesday. The biennial election has not taken place since 2009 due to differences among the unions, leading to postponements on four occasions. The TU had postponed the FSU polls for March 1 from February 25, following the demand from the All Nepal National Independent Union (Revolutionary) close to the Netra Bikram Chand-led CPN Maoist. 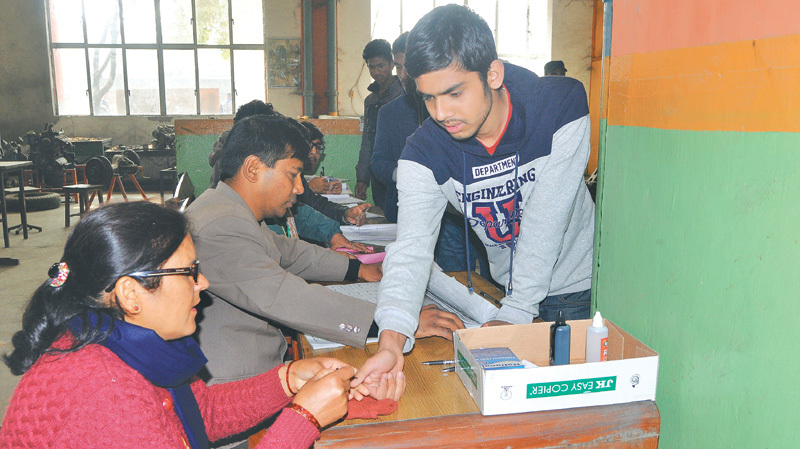 While the country of votes in many of the small colleges was over on Wednesday evening itself, overall results of all the colleges are expected by Thursday, said Tripathi. The three major unions—Nepal Student Union affiliated with the Nepali Congress, All Nepal National Free Student Union student wing of the CPN-UML and ANNISU-R close to the CPN (Maoist Centre)—are expected to dominate the results. Even as the students are waiting for the official results from the TU with baited breath, the three unions are making their own projections. The NSU claims to have won presidential positions in 25 colleges, with the ANNFSU saying it has won in 32 colleges and the ANNISU-R in 29 colleges. Much like the government, the NSU and the ANNISU-R had formed an electoral alliance in these student elections at the majority of the colleges. DHADING: Four persons, including a candidate running for presidency in the Free Student Union election, sustained serious injuries at Jaya Bageshwori Campus in Malekhu on Wednesday. President candidate of the joint panel of Nepal Student’s Union (NSU) and All Nepal National Independent Student Union-Revolutionary (ANNISU-R) Susmita Tamang and three others—Sujata Bhatta, Parbati Sedhain and Ram Sharan Borang—were injured when the rival student organisations attacked them by hurling stones. The injured were taken to Kathmandu for treatment.